CARLSBAD, Calif. (AP) _ Mary Pierce routed Ai Sugiyama 6-0, 6-3 Sunday in the finals of the Acura Classic for her first tournament title in more than a year. The sixth-seeded Pierce was dominant, winning 11 of the first 12 games and breaking Sugiyama's serve six straight times. By the time Sugiyama held serve, the seventh game of the second set, Pierce already had a 5-2 lead. Pierce, who has 17 career titles, won for the first time since June 2004, in the Netherlands. "I felt like I played well and did what I needed to win,'' said Pierce, a two-time Grand Slam champion. Although Sugiyama held a 6-4 career edge over Pierce and the two had played numerous tight matches, this one was never close. The only drama was how quickly Pierce would end it. Sugiyama appeared tired at times. After winning her singles semifinal on Saturday night, she played in a doubles match that lasted until nearly midnight. Sugiyama agreed that her playing schedule worked against her. "It was tough because I played so late (Saturday),'' she said. Pierce, ranked 14th in the world, attacked Sugiyama's serve from the start. Pierce allowed her only two points on serve in the first set which took 22 minutes. Things didn't get much better for Sugiyama, even though she broke Pierce's serve in the first game of the second set. Sugiyama, who played with her left thigh wrapped all week as a preventive measure, called for the WTA trainer at 2-1 and received treatment for a split nail on her right big toe. Pierce broke Sugiyama's serve three straight times after the medical timeout to go ahead 5-1. Pierce squandered four match points in the next game and double-faulted to give Sugiyama the game. Sugiyama saved two more match points, including when Pierce whiffed on a forehand overhead at the net. The 75-minute match ended when Pierce hit a 109 mph ace to capture the winner's purse of $189,000. 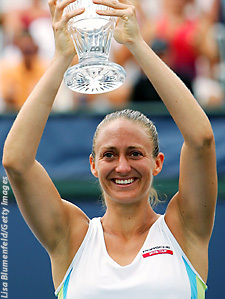 Pierce became the 16th WTA player to exceed $16 million in career earnings.